I want to be in pictures! I love the Foodgawker.com site, and I soooo want to make it on. I read, and I mean read my Nikon Coolpix S60 book, all 168 pages. I have learned about white balance and pixels, f stops and memory. I was a mean photographer in the day. I also have a Canon EOS digital with a bevy of lenses, so it is not for lack of cameras. I have 2 ancient Canon 35mm SLR bodies, 5 lenses, and a dozen filters. I did everything manually in those days, including developing my own film. My college apartment bathroom had negatives hanging about every day. I moved into the world of auto focus 35mm, then the digital revolution, and now that I want super close up, crystal clear pictures of gooey chocolate, toasty nuts and snow white meringues I am lost. Point and shoot just doesn't cut it in the cut throat world of food photography. But I think I'm catching on...so I decided I would go with the Chocolate Mocha Macadamia Nut Cookies. Because it is Wednesday, that means volleyball workouts with a group of college girls. They come for the workout, and I told them I would bring them "care packages" as a thank you. What college kids doesn't miss that home baked goodness? Little Debbie's may satisfy the sugar fix, but they don't make you long for home, or at least not for me. So this week I thought I'd do a little freezer cleaning and came across a bag of Macadamia nuts. So I went to Spago Chocolate for the right recipe. I mean Macadamia and chocolate, sounded good to me. The recipe is pretty straight forward. They were a little crunchier than I would have liked, and although they recommended chopping the macadamias, I wish I hadn't. I will also add more chocolate next time. But honestly, with a cup of coffee, these little bad boys are fabulous. So we'll see if I am yet worthy! Sift dry ingredients. Beat sugars and butter until fluffy. Lower speed and add eggs one at a time, and vanilla. On low speed, add dry ingredients. When incorporated add chocolate and nuts. Wrap dough in plastic wrap and chill 2-3 hours or longer. Preheat oven to 350° and bake 1" size balls on Silpat covered sheets for about 13 minutes total. Of course move sheets from front to back halfway during baking. Cool on rack. The balls can be rolled and frozen on a sheet and then dropped into a freezer bag when firm and bakes as needed. They take a little longer when frozen. Okay, let me just say, this is not what I would consider a baker's challenge. The Daring Baker's is a "secret" baking club. We get our challenge at the beginning of the month, and we all reveal our blog and photos on the same day, (today). This was however, a challenge. First, how to find the time...March has slipped away, today is post day, and here I am, kneading pasta dough, cooling Bechamel, simmering ragu. I am making a vegetarian ragu because it is Lent and it's Friday. So my personal recipe follows, the other recipes are the ones we were instructed to use. A note on the pasta. We were challenged to not use our Kitchen Aids or pasta rollers. I abided by the rules...and my arms are exhausted! I kneaded and kneaded and kneaded. I didn't believe it would come together, but it did. Then after resting...the rolling! I divided my dough into 4 balls and rolled each and cut them into 3 slices, about 4X10 each. I did not get it rolled thin enough to see through (seriously??? ), but it looks good, and tastes good. We'll see if it turns into a clunker when it is assembled. This was an all day process for dinner. So much could be made ahead, and lucky for me I have left over pasta and ragu which I froze. I used all the Bechamel and I think next time I assemble it I will use my vegetarian ragu, Bechamel and maybe some crispy prosciutto and more spinach. The finished pasta was out of this world. Really. I will do it again, but with the Kitchen Aid and pasta machine, although I truly loved channeling my Italian Grandmothers. My secret hope is that next month's challenge involves yeast!!! Get in there and cook!!! Stir well and simmer partially covered for a few hours. It should be thick, season toward the end with salt and pepper. Steam a bunch of trimmed asparagus, and lay the asparagus on the Bechamel in the assembly process. Note: although it is not traditional, Enza has successfully made pasta with a marble rolling pin, and this can be substituted for the wooden pin, if you have one. One of my favorite cookbooks is more like a tribute book to great chefs. It's called My Last Supper and chefs tell what they would want for their last meal. I can't decide what my main course would be, but I can promise you I will choose my sugar cookies for dessert without a doubt. They are my all time favorite. This week we decided to shoot a few Flip videos (Flip is a very cool video camera) and sugar cookies for Spring seemed like the perfect project. The video runs 4 minutes, and we think it's a great first attempt! The sugar cookie recipe I use I cut off a bag of Pillsbury flour about 15 years ago. However, I have altered it, surprise! The dough is easily doubled or tripled, freezes beautifully raw, freezes equally well cooked and unfrosted. I usually make a good number of batches at Christmas and freeze dough for Valentines. However after the blog where I cleaned out the freezer in front of God and you, I am really keeping the frozen inventory on the low side. I used my new SideSwipe blade in my Kitchen Aid and have to say I love, love it. Creams butter in a jiffy and no scraping the bowl down. I also have to give a shout out to the Dough Bands. Basically they are giant rubber bands that come in varying widths and you put them on the rolling pin and it keeps your dough at the perfect thickness. No slanted cookies, and works as well for pie and pastry dough. Of course I use a Silpat so nothing sticks, but you have to watch them like a hawk. A minute too long and they'll be a little too brown, not inedible, and nothing a good coating of icing can't hide. The icing is always a little controversial. I love royal icing because it dries like a rock, holds it shapes and absorbs color, however, it isn't really tasty, just very sweet. I found an old Wilton book and made the icing recipe from it. It will harden your arteries just reading it, but it was yummy, made great decorations, took color well and was the absolute perfect flavor for these cookies. I'll never go back. I added Meringue Powder (Wilton) to give the icing a little firmness as it dried and this is the only time I will tell you to use...are you ready?...Clear Artificial Vanilla (also from Wilton). I know, wonders never cease. But who wants to ruin that snow white frosting with brown vanilla? Exactly. You can see from the video clip I used an assortment of icing colors. Paste food coloring will give you great color saturation and you can start with a small dab on a toothpick and add more to get it darker. If you have those little squeeze bottles of coloring from the supermarket, throw them out, it's just not worth it. Wilton sells disposable pastry bags in bulk, no washing the vinyl bags! I divide the icing and use a coupler on each bag so I can change out the tips for stars, writing, grass, outlining, whatever. You can pick up a starter kit of tips and a starter pack of paste colors and if you watch the Sunday paper, you can nab a coupon or look for a Wilton sale at the big craft retailers like Michael's, Hobby Lobby or JoAnn's and start buying the necessary stuff that you will use forever. Cream butter and sugar. Add buttermilk, vanilla and egg. In a separate bowl sift dry ingredients and add to mixer until well combined. Place dough on plastic wrap and shape into a flat disc. Refrigerate at least an hour or freeze in a zippered plastic bag. Preheat oven to 400° If dough is frozen, thaw completely in fridge. Remove disc from fridge and divide in 4 pieces. Use one piece at a time and keep remaining dough in fridge. Generously flour work space with flour and roll cookies to 1/8" thickness. Bake cookies on Silpat with a couple of inches between cookies. Bake for about 3 minutes and switch from front to back, top shelf to lower shelf and bake about 3 minutes more. Watch closely. Once you find the perfect time, all sheets should bake the same because all the cookies are the same thickness if you use dough bands. Cool on Silpat on racks, and then move directly to rack. Cookies can be frozen when cool, or get ready to decorate. In a stand mixer bowl, place meringue powder in warm water to dissolve a little. Add the Crisco and whip for a good 3 minutes, add vanilla and add powdered sugar a cup at a time. Add milk as needed to make icing the right consistency. If you are piping it, you want it a little firmer. If you are simply using a spatula, the icing can be softer. I always have extra powdered sugar on hand to thicken it if needed. Decorate the cookies as desired, and let the frosting firm up before packing into airtight containers. You know all those high brow cookbooks where the authors tell you to make friends with the butcher, the fish monger, the farmer at the market? Well, I'm not sure about you, but I have yet to meet a fish monger in land-locked Memphis (the Mississippi does NOT count). There is a butcher at the meat market, but the dudes at the grocery don't do much meat cutting, I know, my dad is a master. And as for meeting farmers, I get to the market a few times a month and there are hoards of people, unfortunately no one remembers me. But for me, I think the most valuable person in a foodies arsenal is the Wine Guy. I love my liquor store. It is all of 2 minutes away, yes, I timed it. They have a great selection, and they have a happiness guaranteed policy. I am not a creature of habit when it comes to drinking. I am in the habit of drinking a few times a week, and I prefer something red, preferably a pinot, but I hop from label to label. If I buy one and hate it, I return it...no questions asked. I love that. Did I mention my Wine Guy? Jim. He knows everything there is to know about wine, and if he doesn't, well then he is a great salesman. But he has yet to lead me astray. Yesterday my sister and I went in for a bottle, and left with 6. Now that's a sales job! The cheapest, about $12, the best about $32. He would never make me feel bad if I wanted a $12 bottle of wine to enjoy with a night of American Idol. Which we did with an A to Z Rose, delicious! 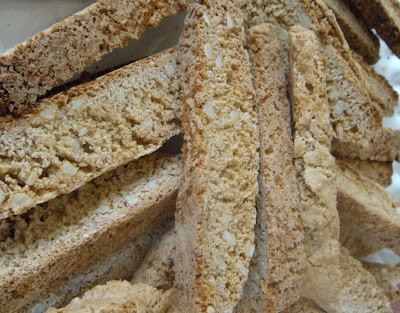 Last summer, I ran in for a quick bottle because I had biscotti in the oven. ATTENTION NOVICE BAKERS: Do not try an alcohol run with cookies in the oven! When I mentioned I was in a hurry because of the cookies, he hinted that perhaps my service would be better with a few samples....okay, what the hell. I'm Italian, and I really love to feed people. So I brought him biscotti. He wanted more this week, so I pulled out my newest cookbook, totally altered the recipe (sorry Chef Stitt) and am offering my sugar for the Wine Guy. As an aside, this is the greatest attachment for a stand mixer. This particular brand is a SideSwipe. I ordered it online at www.sideswipeblade.com. The silicone flaps on the flat beater make mixing quicker, scraping down unnecessary and whipping up dough a breeze. Do not use it for bread and pizza dough, but try it out for cookies and cakes. It's a winner! 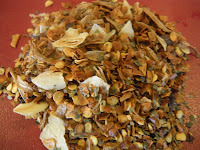 1⅓ cup coarsely chopped raw almonds: I didn't have time to toast them and the cookies were great! Mix dry ingredients in a a small bowl. In a bowl of electric mixer, mix eggs and sugar until pale and thick. Add extracts and mix. Slowly add dry ingredients, and then the almonds Add a few Tablespoons milk if necessary to bind the dough. Using your hands form 2 logs on a large baking sheet lined with a Silpat. Bake at 350° for about 30 minutes, or until cooked but not too brown. Cool logs about 10 minutes and slice into ½" thick slices. Turn oven to 325° and bake about 10 minutes more until crunchy and golden brown. Great Dunkers! So, if you're in Memphis, check out my Wine Guy at Baptist Liquor (okay, it's called Poplar Pike Liquor, after a glass I'll tell ya how the Baptist name came to be). Ask for Jim, and if you're up for anything, start with the Morgan Pinot Noir. MMMMMMM! Now get in there and cook! Winter. Growing up it meant boots and mittens, sleds and snowmen. In Memphis it means grey skies and rain, plunging temps followed by 60 degree days, and sometimes a little ice. In the span of one week I can go from sleeping with the windows open to freezing my fanny off. This week will be just that. So in honor of our 13 degree Thursday on its way, we are going to cupcake heaven. 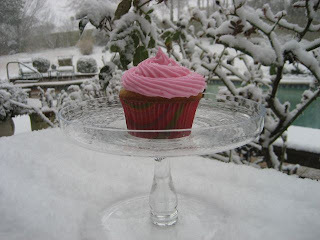 The most wonderful vanilla cupcakes with vanilla buttercream, iced in pink and dusted with pearl sugar. Add a hot chocolate if its in the 30's, cold milk if you see the 50's. Either way it really IS heaven. Working at WS, I have tried the entire line of Sprinkles Cupcake mixes. They really are great if you are not a scratch baker. But, they really are expensive, about $14 for a mix that makes 12 and that doesn't include the frosting. Scratch is always better. This is a good place to reinforce the quality of ingredients. Unsalted butter, kosher salt, Nielsen-Massey Vanilla, paste food coloring. No substitutes allowed, really. Why? First, unsalted butter. The salt in salted butter ranges from 1.5% to 3%. If there is no standard, it is impossible to know how much you should add. Too much and yuck, too little and the depth isn't there. Use unsalted and add the salt yourself! But add only Kosher Salt. Almost every baking recipe calls for salt, and it is critical to the depth of flavor. In a yeast recipe it helps slow the fermentation giving the bread a tighter gluten structure (I could use tighter "glutens" myself), and it helps deter the growth of bacteria and molds. Kosher salt has an interesting structure to it, almost like a pyramid which means it dissolves easily and is truly more flavorful than table salt. It is also additive free. Nielsen-Massey Vanilla. This is Bourbon vanilla and these slender beans come from Madagascar. The flavor is unparalleled. I have had friends make my recipes and complain that it wasn't the same. The difference is always the vanilla. Yes, it is expensive, but so worth it, especially in buttercreams, meringues and sugar cookies. There is no comparison with the stuff in the grocery store. And if your bottle says imitation...well I wouldn't even turn the oven on. Tahitian vanilla is wonderful, but will lose its flavor when baked, use this delicate vanilla for pastry creams or ice creams. Paste Food Coloring. Basically it is the liquid food coloring partially dehydrated. This means a small dab will give you very intense color. The best part is that companies like Wilton have a rainbow of colors to choose from, and they never seem to go bad. A great investment! So now what? We bake! This is a basic yellow cake that everyone raves about. The icing, well, I wish I had a specific recipe, but I really go by look, taste and texture. But I have given you a baseline. Remember, only the best will do, take your time and give these to someone who is really special. 2 t vanilla, only Madagascar vanilla here! Sift flour, baking powder and salt and set aside. Cream butter and sugar and vanilla until smooth and fluffy. Add eggs, one at a time and mix well. Add part flour mixture and then milk alternating until all is combined. An ice cream scoop works great to fill cupcake cups. Fill 24 to about 2/3 fill. Bake at 350 for about 16 minutes. They should look moist, but a tester should come out clean. Cream the butter and vanilla, add confectioner's sugar and milk until you have the consistency that you want. Use all the sugar! 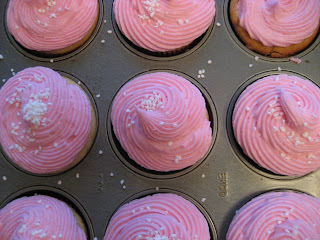 You want the frosting to be soft and moist if you are hoping to get sprinkles to stick. If you are just spreading it on, you can make it a little thicker. Add food paste coloring with a toothpick, just a small glob at a time. The color is very saturated so start slow and add it as you go! There you go. The secret is out. The cupcakes you all love are right here. Get in there and bake!!! There's a loaded question. If I say chicken, everyone groans. If I say chicken Caesar salad or chicken fajitas, everyone is happy. It is all in the description. Mondays are one day that there is no practice, I generally don't work, so I have time to think things through. I spoke to a friend on Sunday when she was cooking dinner, steaks on the grill and baked potatoes. Sounded delicious. My problem is I like rib eyes. The most marbled, fattening steak out there. And my family is not really into baked potatoes, although I like them. So I decided to take the idea and modify it. I went to Kroger, where I never shop. They have a huge store here and I was awed. In the meat department I found flat iron steak. I have never seen this at my regular market, but I have seen it many times on the Food Network and Top Chef. So I bought a flat iron. My plan was to make a chimichurri sauce with it. Which is basically Argentine pesto. 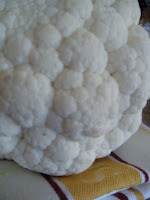 I also bought a head of cauliflower for mock mashed potatoes. Always a salad. And beautiful strawberries and angel food for dessert. Yum. I get all the taste I want for a little better nutrition. I started with recipes, and then, well you know, changed them. Blend it until it is fairly smooth. I put a few Tablespoons all over the steak and put it in a Ziploc and chilled it until dinner time. Take it out about 15 minutes before you heat the grill. Steam the cauliflower covered over a pan of boiling water. When it is cooked, toss into a food processor and blend until smooth. If needed, add a little of the cooking water to thin it out. Add the butter and salt and pepper. Combine well. This can be made ahead and reheated. I don't think it tastes like mashed potatoes, it tastes better! Very low in carbs, has some fiber and you keep its nutrients when you steam vs. boil it. Heat the grill to high, and let the meat come to room temperature. It takes about 5 minutes a side for medium rare. 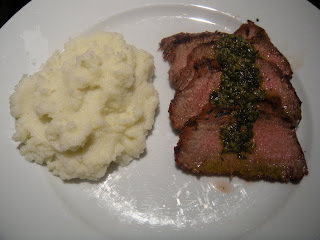 While the steaks are cooking, take about 1 Tablespoon butter in a small saucepan and heat until it just starts to brown, add your chimichurri sauce and cook for a minute or so. When the steaks are done, let them rest a few minutes before you slice. Top with the sauce, a side of mashed goodness. Finish with a salad. Delicious! I justify cookbooks like other women justify shoes. Do I really need it? Do I have one similar that maybe is a little outdated, stained, lose binding? When will I use it? Is it worth it if I only cook one or two things out of it? Of course it is very easy to say yes, yes, yes. A cookbook to me is like a novel. I read it, I go back to it, I flag pages, plan recipes, admire the photos. So last Thursday I went to Williams Sonoma and met Frank Stitts. 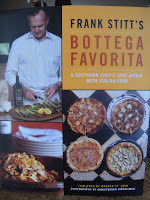 His new cookbook is Bottega Favorita and I probably would have bought it even if I couldn't have it signed. He made the Capellini Gratin to taste, it was very yummy, and scented the store like an Italian trattoria! He is a genuine man, very kind to the staff and the customers, and really makes some of those celebrity chefs look like oafs. I was chatting with the staff before the signing and we were talking about my blog, so he signed my book appropriately enough, "To Susie, Here's to Cooking and Blogging. Frank Stitts" I gave him my card, so perhaps he'll drop by the blog sometime! I had browsed the book before, but I approach a cookbook like a novel. Start at the beginning. I am one of those people who reads the forward and the acknowledgments. Go to the movies with me and you WILL watch the credits to the bitter end! So I started at the beginning of Bottega. The forward is pretty long for a cookbook, but I dove in without looking at the author. By the time I finished, it is four pages, I wanted to go to Bottega and The Highlands and I wrote down the author, Warren St. John to read one of his books. This is a forward that really comes from the heart. This is a patron, a foodie, a fan and he also has the gift of prose. I am anxious to find one of his books. So, not even past the forward yet, I have to say that Frank's wife Pardis has the most beautiful coat on in the photo in the forward. I am not a clothes hound, so if it catches my eye, it's got to be darling! The rest of the book, is a cookbook. Lots of photos, original recipes. One chapter is called Cin Cin! and Cheers! (say chin chin, Chantal taught me that when I was 5!) and is full of cocktail recipes, including homemade limoncello. They look refreshing and sadly for those who know me, they look like hives on ice. I have an alcohol allergy that seems to appear in the presence of citrus. But alas, I will try Harry's Bellini on a spring day to celebrate something great! Just one. There are dozens of recipes I found inspiring. 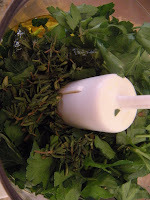 I never use bottled salad dressing, I sort of wing it in the blender every night. I like looking to see other formulas, and use them as a guidepost. I realize most people read a recipe, follow it to the T, and consider it finished. I read a recipe, alter it to fit my taste and ingredients, make it from there and then consider how I will do it next time! I think chefs and cookbook authors understand to some they are the authority and people expect the recipe to be perfect as is, to others (like me) they are making suggestions and planting ideas to foster creativity of the home cook. My first Bottega recipe I tried was Bucatini with Clams, Pancetta, Hot Chili and Rapini. My finished dish looked nothing like this recipe, but it was certainly the inspiration. I love Bucatini. It brings me back to this restaurant in Rome. We toured the Vatican and Palatine Hill all day in a downpour. All 26 of my family members came into this restaurant and they led us to the banquet room. We had great food. Christina had the biggest Calzone, I had this spicy bucatini, my mom had marinara sauce that was divine. I looked all over Memphis for Bucatini, to no avail. When I found it at the Italian market in Florida, I bought 5 packages. I can't make it without spice, it just wouldn't be right. So the Bucatini in this recipe did not change. I opted for shrimp instead of clams for Christina. 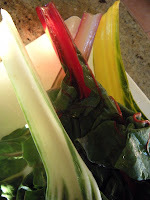 My grocer doesn't carry rapini, so I went for Swiss Chard which I love. There is no substitute for pancetta, it is one of my favorites, so I kept that. The recipe also called for 2 dried chiles. That was a little vague for me. I have bags of dried chiles from New Mexico, but I was unsure if it would give me the heat I needed. I brought home a large quantity of dried seasoning from Italy. Crushed red pepper, dehydrated garlic, carrots, onions. It is very colorful. I was a little afraid the peppers had lost their zip since it is a little old, but thankfully no. There was just enough heat in a tablespoon of this. It turned out to be the perfect meal for the flu. Garlic, olive oil, hot peppers, lemon...this is the Italian cure for sickness. Chicken soup? How boring! Heat the olive oil and brown the garlic cloves. Add pancetta and chiles,and cook until the pancetta begins to get a little brown. Add the chard and cover to wilt. Remove the cover and add wine and shrimp. Meanwhile cook Bucatini in salted boiling water until al dente. Do not discard all the pasta water. When the shrimp is cooked through, remove from heat. Add the Bucatini, butter, lemon juice and toss. Add salt and pepper and parsley to taste. Add a Tablespoon or two of the pasta water to any leftovers to keep them juicy for tomorrow! A few notes. Bucatini is hollow spaghetti, you need a sturdy pasta for this dish. The dried seasoning, chiles or whatever, soften when added early and the flavor is much better than adding dried red pepper at the end like you would on a pizza. Bake it on the pizza sometime, big difference! Finally, pasta water. This is good stuff. It's a little starchy and salty, but adds depth to a dish that needs liquid. I always save a few tablespoons to add before I store the pasta dish as leftovers. So, a wonderful way to jump into a cookbook. I feel better, and the dish was spicy and flavorful. Sorry Pasquale that you weren't here, it was right up your alley! I can hardly wait to hit the dessert chapter.....Zabaglione Meringue Cake, this one will be made exactly to Frank's specifications, I'm adventurous but not dumb! Buon Appetito!